A sweetened creamy mayonnaise dressing gives this easy salad loads of flavor. Sweet red bell peppers and red onions add a festive, colorful touch to the salad. The salad makes enough for 8 to 10 people, and it's easily scaled down for 2 to 4 people. It's a fresh, delicious salad as it is, but feel free to add some bacon, raisins, or lightly toasted chopped walnuts or pecans for the extra crunch and flavor. Sunflower seeds would be an excellent choice as well. I especially like the smoky flavor of crispy bacon pieces. You can make the salad with all broccoli or all cauliflower as well. Serve the salad with a special family Thanksgiving or Christmas dinner, or add it to your menu for any everyday meal. See the tips and variations (below) for some additional ideas and ingredient suggestions, along with an alternative, less sweet dressing mixture. In a large bowl, combine the cauliflower florets with the broccoli florets. Add the bell pepper and chopped onion; toss to blend the ingredients. In a medium bowl, whisk the mayonnaise with the vegetable oil, vinegar, and granulated sugar. Pour the dressing over the salad and toss to coat the vegetables thoroughly. Sprinkle with freshly ground black pepper. Arrange the salad in a serving bowl lined with lettuce leaves, if desired. Cook 4 to 6 slices of bacon. Drain, crumble, and add the bacon to the salad before tossing with the dressing. Add 1/2 cup of sunflower seeds (hulled), pine nuts, chopped pecans, or walnuts before adding the dressing, or use a smaller amount as a garnish. Add about 1/2 cup of raisins to the salad before tossing with the dressing. Add 1/2 cup of shredded or julienned carrots to the cauliflower and broccoli. Add 1/2 cup of chopped celery to the salad. 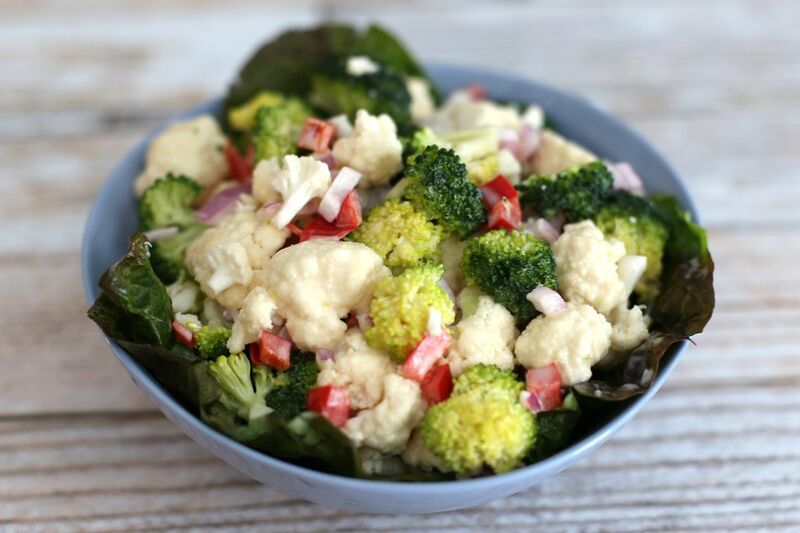 Omit the cauliflower and make the salad with two bunches of broccoli. For an alternative, less sweet dressing, combine 1 cup of sour cream with 1 cup of mayonnaise and a packet (1 ounce) of dry Ranch dressing mix.